Today’s Morning File is written by Erica Butler, your friendly neighbourhood transportation columnist here at the Examiner. Aerial application of glyphosate. Photo courtesy of the Canadian Forest Service. The planned start date for Northern Pulp’s spraying of over 3000 acres of woodland has passed, and the Nova Scotia government has yet to give the green light on the operation. 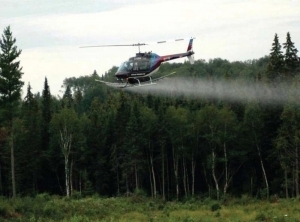 Local Xpress gives lots of background on the opposition to using glyphosate on our forests. Lest you think the current discussion over glyphosate means that we don’t currently use the much-debated chemical in Nova Scotia, the NS Advocate has pointed out that glyphosate was sprayed on 17,946 acres of private land between 2011 and 2014. 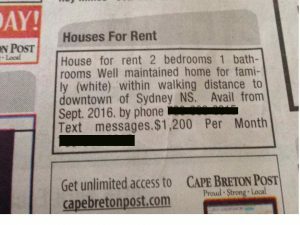 The Cape Breton Post has apologized for running an (unintentionally) racist classified ad offering a house for rent, seemingly only to “white” families. The ad quickly made the rounds on social media, with many a commenter reporting that after calling the posted number (presumably to complain) they discovered someone with limited English skills, who explained that the house they intend to rent was white in colour. The paper clearly failed to vet the ad copy, which was submitted online. 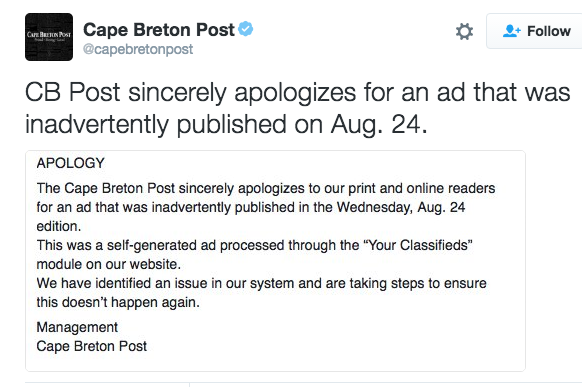 The paper said in a tweet that they’ve “identified the issue and are taking steps to ensure that doesn’t happen again.” No word yet on whether those steps will include hiring actual people to read the paper before it goes to print. Meanwhile, as the confusion clears, we’re all left with the sad realization that the ad was actually believable as published. It has not been a banner week for turbine technology in Nova Scotia. We still don’t know what the heck happened with a wind turbine that fell over near Port Hawkesbury. The CBC reports that an “incident” took place while workers tried a routine component replacement, and that turbines are generally inspected every three to six months by the manufacturer, Enercon, though without any government oversight. And a Bay of Fundy fishermen’s association is going to court to prevent a tidal turbine from going into the Bay of Fundy, at least until a more accurate baseline understanding of the ecosystem in the Minas Basin has been established. Probably due to overtime pay, the list is mostly filled with cops and firefighters. Based on The Coast’s rudimentary count (the file wasn’t released in a spreadsheet), roughly 57 percent of Halifax Regional Police officers are making over $100,000. 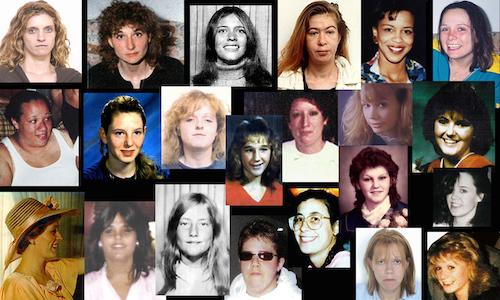 The same is true for about 44 percent of Halifax Regional Fire and Emergency personnel. The list also shows that our top earner, former CAO Richard Butts, took in almost twice ($346,336) what our mayor was paid last year ($177,000). 5. 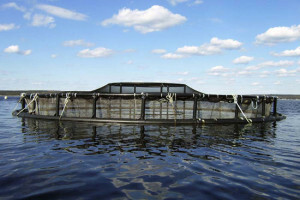 What’s new in fish farms? The Ecology Action Centre is calling foul on a Cooke Aquaculture application to renew a Shelburne aquaculture lease. The EAC says the Cooke site is actually 40 metres from their existing license, and so should be considered a new application under Nova Scotia’s brand spanking new guidelines, which themselves have come under criticism for not going far enough to protect coastal waters from the environmental effects of open pen fish farming. As the Coast’s Voice of the City this week, beekeeper and member of the Citizen’s Climate Lobby David Henry takes on Nova Scotia environment minister Margaret Miller’s attitude on climate change, specifically that we can’t afford emissions targets designed to slow it down. Minister Miller and her colleagues still see environment and economy as adversaries. Their thinking, like the economy they seek to protect, reflects a past that is long gone. In its place a sustainable future, both economically and environmentally, is taking shape. Visionary thinking and smart carbon pricing can help Nova Scotia thrive in it. EDITOR: Maybe someone out there can explain this to me, because at the moment I’m very confused. Here on the island we have fish kill after fish kill, yet government and people like the Irvings/McCains claim it’s not their fault? Could it be Martians spraying these poisonous chemicals on potato crops and killing the fish? Surely if it is not potato farmers then the Martians are the only other logical answer. Can’t be upstanding farmers like Mr. Ellis (fined $72,000 for fish kill). Didn’t the premier just reward him with a plum job on the board of health. Then we have D.S. Ellis Inc., another potato farmer from the O’Leary area. He was charged with chemical run off into the Barclay Brook that killed hundreds of fish. Guess what? The judge found him not guilty. In fact he recently received an environmental stewardship award. So folks if it’s not someone locally spraying chemicals, who else can it be but those pesky Martians? This mystery has sure got me stumped. I keep thinking about that poor lady getting all those calls from properly angry folks who read her ad. You know, editors could really do a lot of good in the world, if we could just give them a shot.